Receipts into the federal Highway Trust Fund (HTF) comes from a variety of taxes on highway fuel, tires, heavy vehicle use tax, truck/trailer sales taxes. The motor fuel excise tax, currently 18.4 cents per gallon for gasoline/gasohol, and 24.4 cents for special fuel (primarily diesel) raises the majority of the revenue. This revenue is then placed into the Highway Trust fund by the US Treasury Department, after collection by the Internal Revenue Service. These funds are then distributed to the States based on formulas provided in Federal legislation. 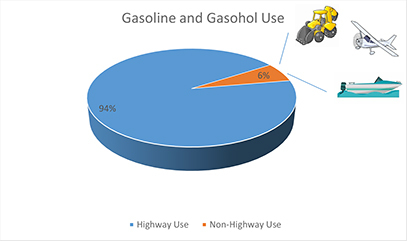 Non Highway accounts for about 3% of gasoline use, and includes agriculture, recreational boating, construction, industrial/commercial, and small plane use.